Wilmington, DE – Lt. 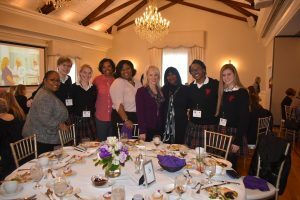 Governor Bethany Hall-Long, PhD., was celebrated by the University and Whist Club of Wilmington today with a luncheon as their honoree for International Women’s Day. Events around the world today serve to highlight the social, economic, cultural and political achievements of women across the globe. Today’s event marks the second year the Whist has recognized a Delaware woman for her contributions and achievements on behalf of women in Delaware and across the globe. “Today was such a wonderful event. This is our second year celebrating International Women’s Day here at the Whist, and we couldn’t have been more pleased than to celebrate the Lt. Governor’s accomplishments as a way to recognize this day,” said Stacey Inglis with the University & Whist Club. A packed room of nearly 180 individuals listened as a series of speakers honored Lt. Governor Hall-Long with presentations and spoke about her experience and work in the areas of health policy, government, and advocacy for the community on issues from addiction and expanding healthcare and treatment. In a prepared letter read by James Collins, Delaware’s Chief Information Officer, Governor Carney lauded the Lt. Governor, noting that “Bethany has proven her commitment to help our most vulnerable. As Lieutenant Governor, and as Chair of the Behavioral Health Consortium, she’s doing important work to confront the addiction crisis and improve mental health services for Delawareans”.